Six cars drove past Wildman’s convenience store on the Sterling Highway in about two minutes on a recent weekend afternoon. Two of them pulled in. Wildman’s is one of the few businesses in Cooper Landing that stays open in the winter, much less on a Sunday. General manager Heather Harrison says the business makes most of its money off the crowds of fishermen, tourists and commuters that clog the highway in the summer. But winter business is important, too. 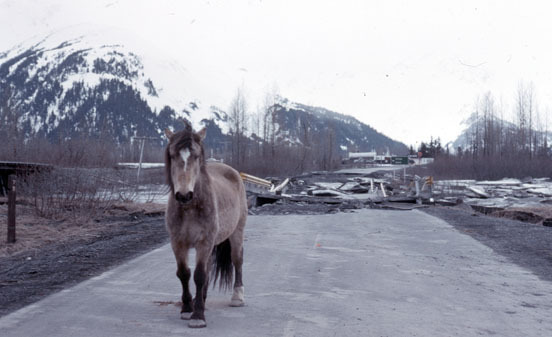 That, and the fact that she’s on the Cooper Landing planning advisory committee, has her keeping an eye of the Alaska Department of Transportation’s plans to reroute the Sterling Highway through town. On Dec. 11, DOT announced its preferred route, building 5.5 miles of new highway north of town, and rejoining the existing Sterling Highway at Mile 51.5 between Cooper Creek and Gwin’s Lodge. It’s the most-expensive alternative of the four DOT considered, and involves the least mileage of new road. 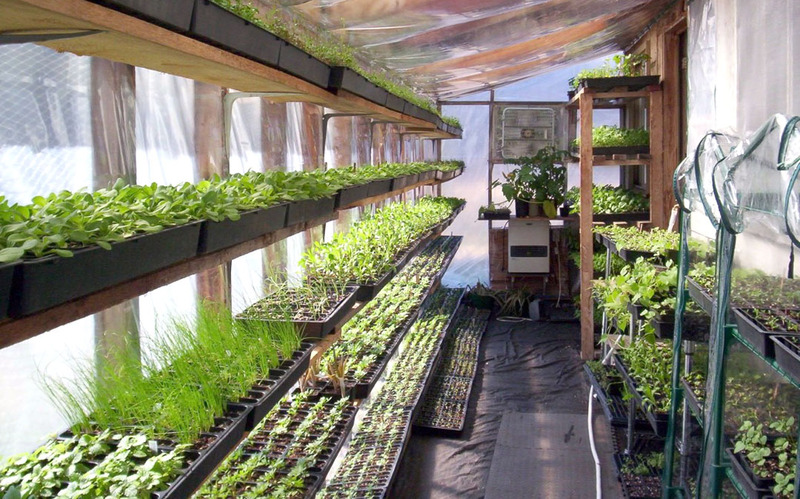 “I find the final plan to be a little surprising that they are bringing it out so close to town. 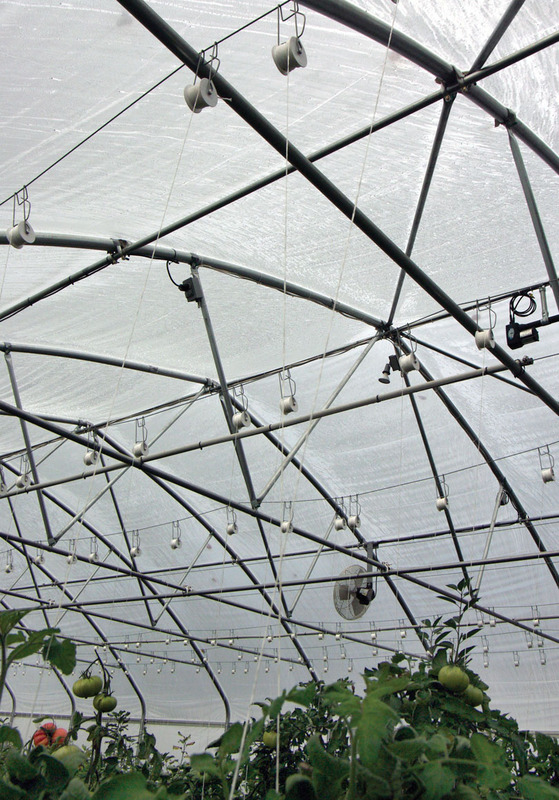 It’s not going to bypass nearly as much as people thought,” Harrison said. That’s both good news and bad to Harrison. First, she’s been worried what the bypass would do to winter business. “Would I take the bypass as a traveler going to Anchorage to get around all the S curves, away from the road, yeah, I would. It’s safer, it’s faster,” she said. A trip through Cooper Landing is like driving back in time. 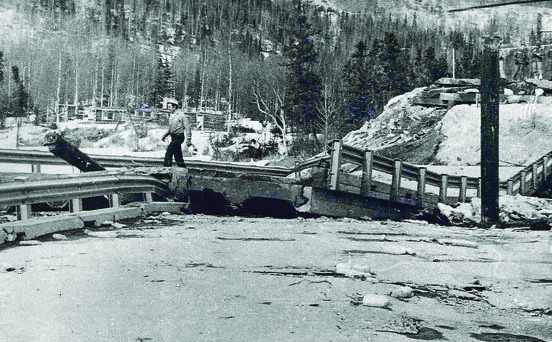 Other than some repaving and filled potholes, the road hasn’t been upgraded since the Sterling Highway was completed in 1950, and it shows. Tight S curves with little visibility cling to hillsides and wind just above Kenai Lake and the Kenai River. Narrow lanes crowd big trucks, and the shoulders could be measured with rulers, not tape measures. 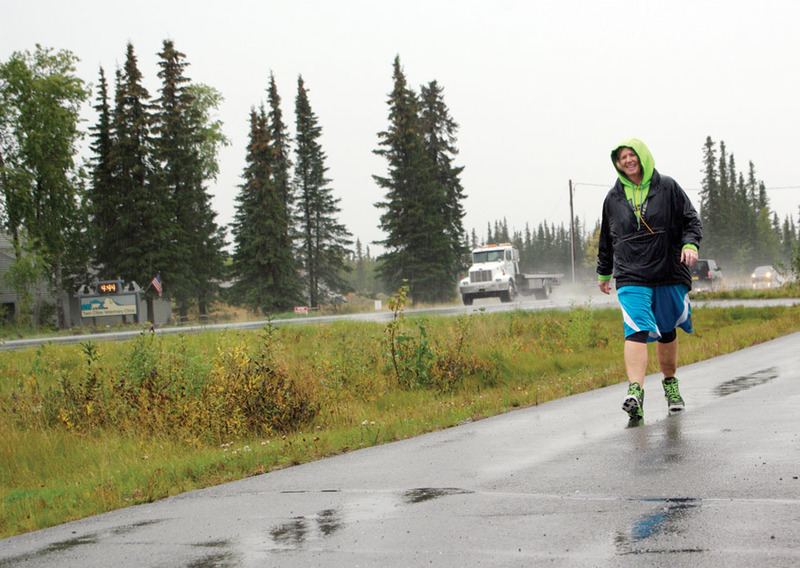 “Sometimes you can see the fog line on the outside of the lane that’s actually painted on gravel,” said Kelly Petersen, project manager with the Alaska Department of Transportation and Public Facilities. Though the road hasn’t been upgraded in 65 years, traffic and its associated problems continue to increase. From 2000 to 2009, ADOT recorded 303 crashes between Mileposts 45 and 60, with 153 in the winter and 150 in the summer. “Anyone that’s driven through this piece of highway, you know immediately when you’re at Milepost 45 because there’s no clear zones, there’s no shoulder, you’re more white-knuckled. And this is the place that everybody wants to be for the world-class experience of fishing,” Petersen said. Yet a fix has been a long time coming. 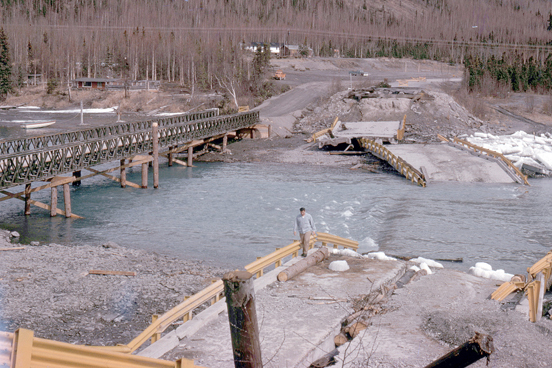 ADOT started working on an Environmental Impact Statement for a highway upgrade in the early 1980s, but for a longer stretch of the road — from Milepost 37 east of Cooper Landing, closer to the junction with the Seward Highway, to Milepost 60, west of the intersection with Skilak Lake Road. The project got split in two, with an upgrade of miles 37 to 45 being completed in 2001. The rest has been on the to-do list for so long that the original EIS has become the oldest environmental document for a highway project in the country. But while the need for a safer road has been obvious, a solution has not. “This project is in a unique place because it’s right next to Kenai Lake and the Kenai River, it’s a critical area with great salmon runs that are world famous. So, working between that and fairly steep terrain. And then, of course, we’ve got a wilderness area plus multiple trailheads, and there’s also cultural sites — archaeological and otherwise. So it’s definitely a challenging place to build,” said Shannon McCarthy, ADOT spokesperson. Any one of those challenges can be a significant hurdle to a highway project. And in this case, the challenges kept coming. “There’s just been a lot of changes in the corridor, both in traffic, the formation of (the Kenai River Special Management Area), the identification of selection properties under (the Alaska Native Claims Settlement Act). The whole issue is, this is a complex piece,” Petersen said. Trappers, plus dog owners, plus trails and other public-use recreation areas from Cooper Landing to Seward, equal a contentious situation. One which the Alaska Board of Game will try to solve in its meeting in Anchorage this week. The board started deliberations Sunday afternoon after public testimony wrapped up. It was scheduled to address the trapping ban, as wells as a slate of other Kenai Peninsula proposals and the rest of its business pertaining to the Southcentral Region, sometime before its scheduled adjournment Tuesday. But as of Tuesday afternoon, it looked as though deliberations would stretch into Wednesday. Testimony came both for and against the proposals. Those opposed spoke of wanting to find a solution among the interested parties, without regulations needing to be involved. Randy Zarnke, president of the Alaska Trappers Association, advocates a mutual voluntary approach the group has used in Fairbanks, where the ATA and dog owners identified two popular recreational areas and hung signs advising trappers not to set traps or snares in the area, and advising dog owners of the importance of keeping their pets on leash. “It relies on efforts from both sides of the issue, the trappers, and the one group that seems to have the biggest conflict is dog owners. And we offered the mutual voluntary approach to the person who submitted (the Cooper Landing proposal). And it was rejected.” Zarnke said. Tom Lassard, who has trapped in Cooper Landing since 1987, decided to post similar signs in Cooper Landing this winter, and had trappers in the Seward area do the same, despite communications breaking down between he and Ken Green, the author of the Cooper Landing proposal. Lassard then requested that Green withdraw his proposal, to no avail. Zarnke told the board that he had hoped the trappers association and Green’s Committee for Safe Public Lands and Trails could continue talking about a mutual voluntary approach. “We feel like we’ve taken what actions we can to ameliorate, reduce, eliminate problems and conflicts, and we’ve seen no response from the other side,” Zarnke said. Green said he welcomes continued dialogue, but that Lassard ceased talks when he wouldn’t withdraw his proposal. Photos courtesy of Phil Hilbruner. 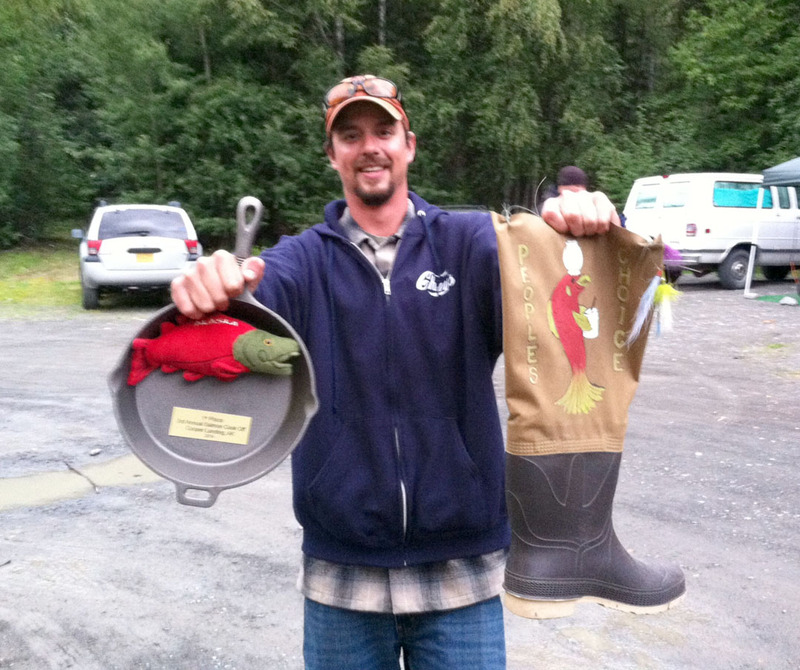 Phil Hilbruner shows off his trophies for winning the judge’s and people’s choice awards in the third annual Cooper Landing Salmon Cook-Off. It seems blasphemous to consider, but even firm-fleshed, processed-fresh Kenai River salmon can be too much of a good thing when the volume of fillets in the freezer far outnumber one’s recipes for preparing it. Salmon patties, salmon salad, baked salmon with lemon and dill or grilled salmon with garlic and seasoning salt are all good at the start of the season, but can downgrade to all right come midwinter when they’ve been regulars on the weekly dinner menu. Phil Hilbruner knows that firsthand. When he moved to Alaska nine years ago to work as a fishing guide, first as a hired guide then starting his own guide business, Catch-A-Drift Guiding, salmon was his staple sustenance. Repetition eventually wore the shine off even dime-bright catches. “I was kind of a broke trout bum for a handful or years. To make ends meet I ate a fair amount of salmon. I kind of got burned out on seared salmon and grilled salmon,” he said. Though he enjoys cooking, salmon isn’t often on his menu. In recent years he’s only kept a few sockeyes and silvers to smoke or use for sushi, not thinking much beyond that about their culinary possibilities. Until last August, that is, when he attended the second annual Salmon Cook-off in Cooper Landing. The variety was impressive and the creativity inspiring. Even the familiar dishes — salmon dips, salmon cakes and the like — were prepared so expertly to make them taste like a whole new take on Southcentral’s staple fish. The event, held as a fundraiser for the Cooper Landing Library, was such a good time that he decided to attend again this year. Until his friend Lynda Nugent, who spearheads the event, talked him into competing in this year’s cook-off, held Aug. 9. Nugent manages the Princess RV Park and General Store, and the first cook-off came about as just a fun thing to do around the RV park and a way to use up some of the sea of salmon Cooper Landing was swimming in that year. Photos courtesy of Mona Painter. 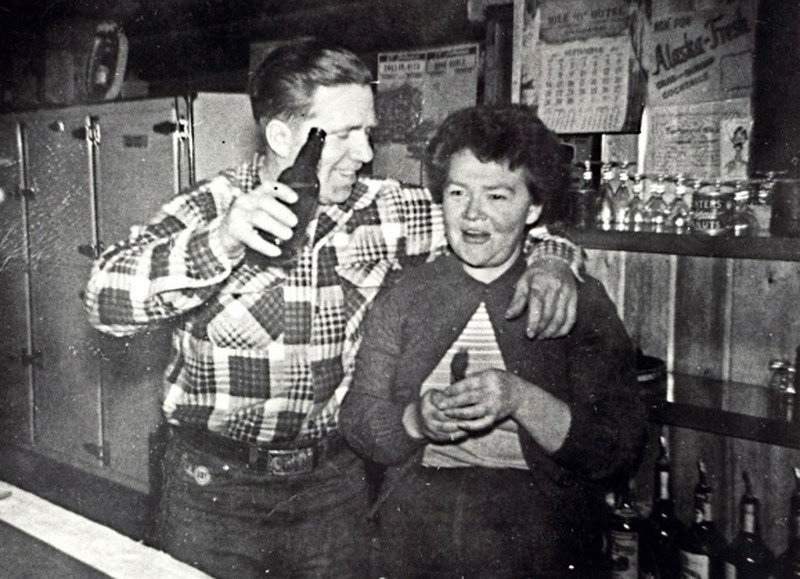 Pat and Helen in the bar at Gwin’s Lodge in 1952. Helen Gwin spent 26 years looking out for residents, visitors and travelers through Cooper Landing as the proprietor of Gwin’s Lodge, which she and her husband, Patrick “Pat” Gwin, started in 1946. Even after retiring in 1976 and until her death at age 92 in 2007, she still kept an eye out for the community she loved and had lived in for 61 years, by volunteering for several organizations integral to the character of the town, many of which she helped found. If Cooper Landing gets its way in the coming year, this pioneer of its past will have a permanent link into the area’s present and future, giving Gwin a spot to peek down on her lodge site along the Kenai River and her beloved community beyond it, by naming a mountain peak in her honor. Mayme Ohnemus and Mona Painter, members of the Cooper Landing Historical Society and friends of Gwin’s, have researched, compiled and submitted the application and documentation required to request an unnamed peak of the mountain directly to the south behind Gwin’s Lodge, at Mile 52 of the Sterling Highway, be named Helen Gwin Peak, and a ridge running to the west of the peak be named for Helen’s husband, Pat. Ohnemus said the idea came from a previous owner of Gwin’s Lodge, Bob Siter, who had mentioned it to Helen, who was tickled at the thought of a mountain bearing her name. “She was so pleased with that. She just really was pleased he wanted to do that,” Ohnemus said. But a little research made it clear the idea was a dead end at that time — as Gwin currently wasn’t. The regulations governing the naming of geographic features after individuals state that the honoree must be dead for five years before an application may be considered. 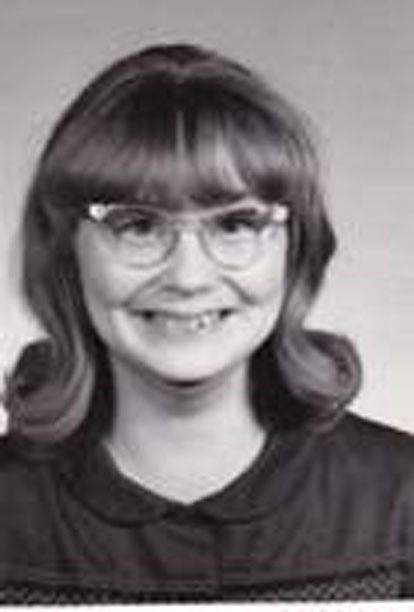 Gwin died in 2007, and Pat before her in 1986. Ohnemus didn’t forget the idea, just like she couldn’t forget Helen and Pat. 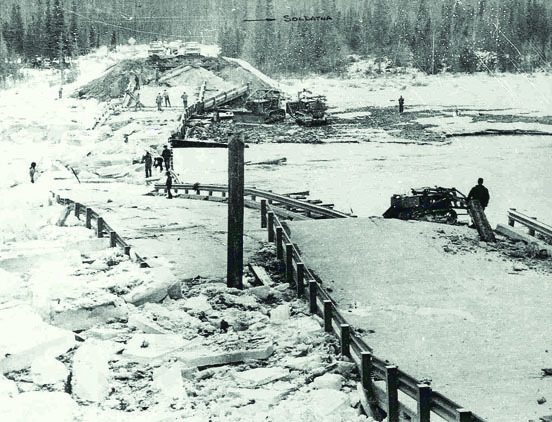 The two came to the Kenai Peninsula from Colorado in 1946, landing in Seward and settling in Cooper Landing, which is as far as the existing road at the time would take them. But they saw potential in the tiny town, then with a population of only about 100, but with ample hunting and fishing resources all around them. The Gwins applied for a roadhouse license, thinking business would grow along with traffic along the new road being planned for the area. 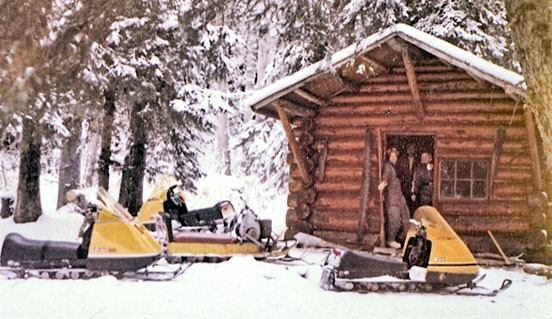 They started out operating a small packaged goods store out of a tent until starting construction of the lodge in 1950, cutting, hauling and hand-peeling the logs themselves. The lodge opened in January 1953 to serve Cooper Landing residents and the trickle of travelers and fishermen that were starting to traverse the Sterling Highway, completed in 1950, and the Seward Highway connecting the peninsula to Anchorage, completed in 1951. They added a kitchen in 1953 and the restaurant and bar in 1954, with Helen doing the cooking and cleaning. Helen and husband, Pat, divorced in 1959 and Helen remained to run the lodge. They stayed friends, though, in a cantankerous fashion that suited them, not inviting anyone else’s opinion on the matter, with Pat returning to live out the rest of his days at the lodge. “He was kind of an old rascal and she called him ‘Old Buzzard,’ and he loved it when she did,” Ohnemus said. Helen herself had a reputation for being a tough old bird, once reportedly swatting a brown bear away from the back door with a broom. But there was some downy softness to her, as well — particularly for animals. “She was tough when she had to be tough but other times her heart would just melt. She loved animals and there were all these rabbits around the lodge. Pat would come in with a little baby rabbit, and hand her one of these little rabbits that would have to be fed with an eyedropper and her heart would just melt — and he knew how to work her that way,” Ohnemus said. Photo by Joseph Robertia, Redoubt Reporter. A hiker and dogs enjoy a clear day in the Cooper Landing area last winter. From November through March, hikers, skiers and others recreating with their pets should be aware of trapping season. Having your dog caught in a hunting snare or trap just once is a traumatically memorable experience. Ken Green, of Cooper Landing, has had it happen multiple times, and always in popular recreation areas, not far from a road or trail. On one occasion it was in a conibear — a powerful, snap-type trap, rather than a less-destructive snare — that had long been abandoned. 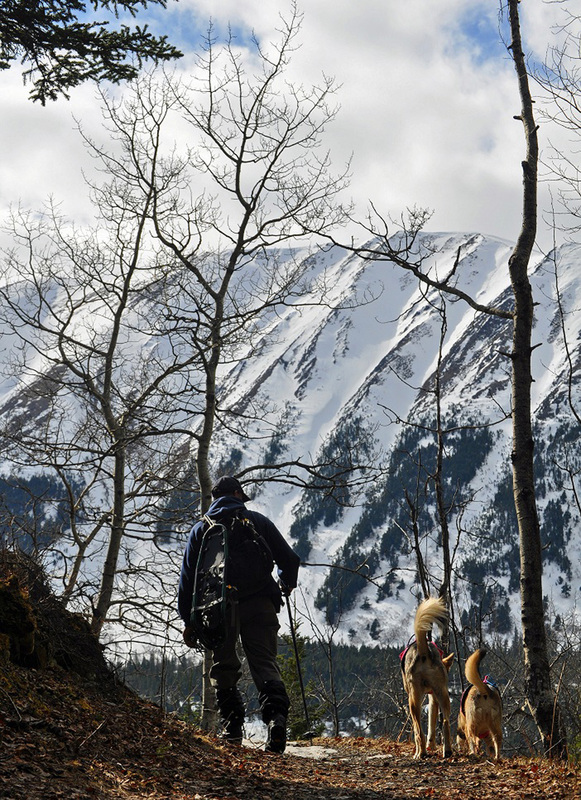 He is not alone, particularly in an area like Cooper Landing, where tracts of the Chugach National Forest are open to trapping as well as dog-friendly recreational pursuits, like hiking, biking and skijoring.